Everyone’s preferences are different when it comes to engagement rings. Some like it modest, plain and simple, others prefer a center gemstone surrounded by a collection of round pavé diamonds that reflect just enough light to flash the focus back to the center stone with the purpose of creating interest and attracting attention. If you find yourself identifying with the later, halo rings are for you! Halo rings create a list of options that make it possible for both high-carat and small-carat diamonds to appear larger than their actual measurement, as well as ways to customize your ring. This month on the blog we’re talking about the hype on halo rings and things to consider when creating your very own. Next up, choose your cut. While round and princess-cut stones are always a safe bet, halo rings can feature almost any stone shape. Maybe ovals are more your style? Perhaps pears and marquises are a better fit? Regardless of the shape, know that the surrounding halo will only enhance its dazzle and brightness, giving your piece that extra oomph you may be looking for. Choosing the color of your pavé halo is yet another option in which to maximize the customization of your ring. Some like their halos to include rubies or sapphires for an extra burst of personality, others prefer the reverse — colorless diamonds surrounded by a bright and vivid center stone (usually sapphire or yellow diamond). In the search for more bling, some have transitioned from the classic single halo to a double, even triple halo. 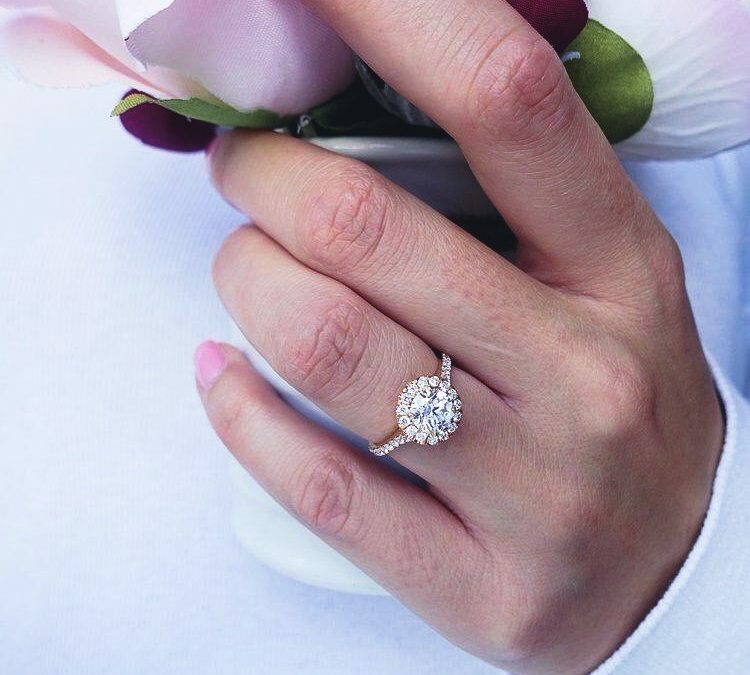 With each additional halo comes the illusion of a bigger center stone. Here at Heart to Heart, we cast no judgement, bigger is bigger, and to each their own! The typical metal choices when it comes to halo rings are white gold and platinum. However, today we’re talking about exploring all of your options for a jewelry outcome most relatable to you. Maybe yellow gold fits your fancy? Yellow gold may deem a great choice for diamonds that already hold a small tint of yellow. While white gold may emphasize such a tint, yellow gold will do just the opposite and help to hide the slight imperfection. Rose gold is another metal option that is becoming increasingly popular and may speak directly to you. We think rose gold does a great job of portraying a vintage feel with it’s soft, pink undertones. Whatever stone, shape, color and metal you choose, we hope your ring is crafted to your exact specifications. Here at Heart to Heart Fine Jewelry we are all about giving our customers what they want. We take great satisfaction in delivering superior craftsmanship and customer service. We’d be honored to help you create your perfect halo ring — don’t hesitate to contact us!